Beautiful script letters can add the perfect finishing touch to anything from wedding invitations to personalized gifts. These script letters are also known as calligraphy, an ancient art form dating back as early as 500 A.D. Calligraphy is a delicate craft that often takes time and patience to perfect, even using exemplars: sheets of paper with examples of calligraphic writing on them. However, with the right tools and a few simple guidelines, it is easy to begin practicing this timeless art form. 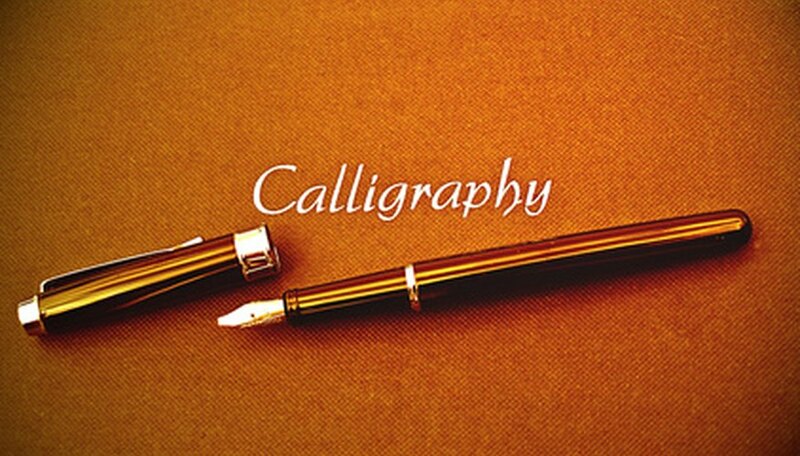 Test your fountain calligraphy pen's sensitivity by trying a few strokes out on the paper. Do not use firm pressure. Instead, touch the pen to the paper lightly and move it around until you have determined how much pressure is required to pull the ink from the pen. Use this amount of pressure when you begin forming your letters. Determine how large you want your letters to be, and use the lined paper as a guide to keeping your letters equally sized and straight. Copy what you see on your exemplar, making sure to follow the arrows or stroke guides. Practice the entire alphabet first, forming each letter with the pen held at a slight angle. You will want to practice forming each letter at least three or four times before moving on to the next one. Once you have practiced each letter a few times, try writing your own words and phrases. Writing script letters is not the same as forming letters using your own handwriting. Be sure to follow the strokes your exemplar recommends to form the letter properly. There are thousands of books with pages of calligraphy exemplars. Consider a visit to your local library, where you can find a book of exemplars and choose your favorite font to try. Melissa Glidden has been writing for eHow and Answerbag since 2010. She holds a Bachelor of Arts in English from The University of Texas-Pan American.